I had grand plans for writing my race report much sooner than almost 2 months after the race.... but, well, you know me. Terrible turn-around time, blah blah blah. Sometime in mid-2010 I was chatting on twitter with my friend Beth, who was finishing up the oh-so-fabulous Couch to 5K plan. "Hey Beth!" I said. "Let meet up in Dallas (about mid-way between the two of us) and run the White Rock Half together!" 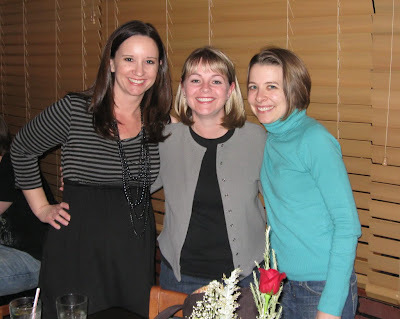 FF to December 4, 2010, and the hubs and I were heading down to Dallas to meet Beth! Beth and I had plans to meet Elaine for dinner that evening. Elaine's a runner too and might have been running with us if she wasn't pregnant. Beth, Elaine and I "met" almost 5 years ago on an online message board for our daughters, Chickie, Big Sis, and WC, who are the same age. Elaine and I have gotten together in person a few times over the years, but it was the first time that either of us had gotten to meet Beth in person. We had a fabulous time at a great local Italian restaurant, and Beth and I headed in early to get a good night's sleep. The next morning my friend Jennifer joined us at the hotel bright and early and about 7 we headed to the metro stop that would take us right into Fair Park for the start of the race. I was so glad we didn't rush to the race earlier- due to the number of people running in the full, half, and relay, saying it was crowded is an understatement. We were in one of the back corrals due to our predicted finish time and we actually didn't take off until 8:55, almost an hour after the race started! It was pretty cold, around 30, but if you know me you know I have boiling blood and am so hot natured that it really didn't bother me. I wore all C9 gear from Target - running capris (recommended to me by Chic Runner! ), mesh shorts, a dry-fit shell and a light jacket with a hood. I had my ipod all charged up and ready to go with Can You Keep a Secret? by Sophie Kinsella, and of course I had my trusty Garmin Forerunner 205 on. I typically follow the run-a-mile-walk-a-minute routine, but I was so jazzed when we finally started that I actually went ahead and ran 3 miles without stopping. A little after mile 3 I stopped to go to the bathroom (mouse bladder alert!). I think that's about when I took my jacket off and tied it around my waist. Feeling recharged, I started back up and continued stopping at each mile marker and walking for a minute. Around mile 10 I knew that even with my half-point break I was going to make my goal of 2:20, no problem. That felt good! I took my headphone out a few times to listen to the bands that were playing as I passed by them- especially when I heard a little Led Zeppelin! So cool. I started looking for the hubs during the last mile, and sure enough I saw him right before the finish line! He was cheering and I was so glad to see him! I finished in 2:18 and couldn't have been happier with my time. 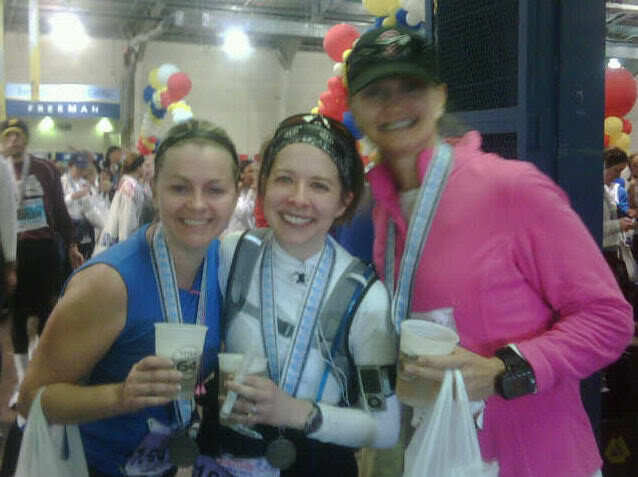 I found Jennifer right after I finished, and we ran into Beth not long after. Amazing that we easily found each other with so many people there! It was a great experience and I can't wait to do it again- I'm hoping to do the Dallas Rock 'n' Roll Half in March- any takers? I am running the Rock N Roll half in Dallas. It's in the middle of my full training for the Memorial! I am so excited it's a race that benefits Komen for the Cure. you're a stud. great time and you looked soooo cute! i do love the C9 stuff from target although i haven't worked out in a year...when i do, though, i'll know what to buy! It was so much fun to meet you & run our first half--you did AWESOME! I heard that the Luna Moons are discontinued and those are my FAVORITE. Booooo.